Happy Mochi Yum Yum by Monica Solorio! These fabrics make me smile! They're absolutely my colors and I couldn't wait to get a hold of this delightful bundle. This is Monica's second fabric collection and is inspired by Monica's happy memories of colorful displays of sweet mochi confections seen in the Japanese grocery stores when she lived in Honolulu, Hawaii. And for Happy Mochi Yum Yum projects and inspiration check out the Happy Zombie Flickr Group. Yummy, I want some too now!! It is soooo happy! :) One of those I'm not going to be able to resist for long I'm afraid! Beautiful!! looking forward to seeing what you make out of this. I'm finding that I'm all "eh" about these fabrics until I come here and then I want them all!!!!!! They are very yummy fabrics! They are really happy and yummy fabrics. What fun to play with those. thanks for sharing these fabrics with us, love the colors! 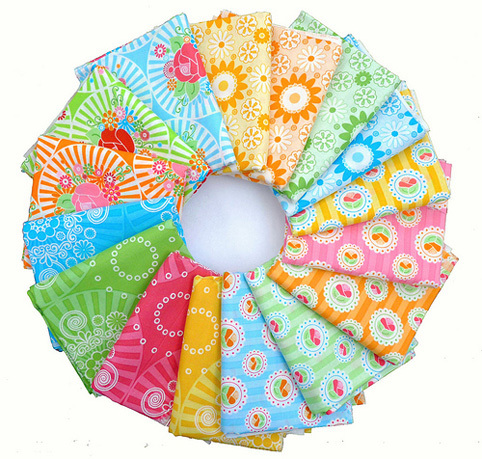 These fabrics are absolutely delightful, fun, bright, cheery, and look like a really tasty treat. They make me smile and bring cheer. Thank you for sharing. I think I need to shop. Oh wow! These are so happy!!! Oh, wow! How beautiful. I love those colors. Terrific gal and designer--I love to see her studio and designs. I just read the article on her that was in the most recent AP&Q mag. I've gotta get some Mochi too! Mochi YumYum is gorgeous! I want some of those. I can see them all done up in a pretty modern quilt! Those colors are just so happy and bright. Beautiful, thanks for sharing with us. 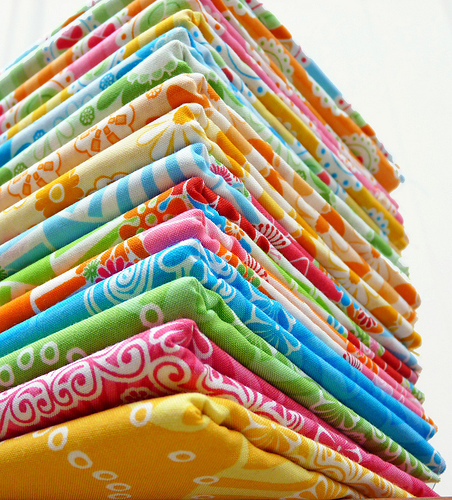 SUCH a fun bundle of fabrics! 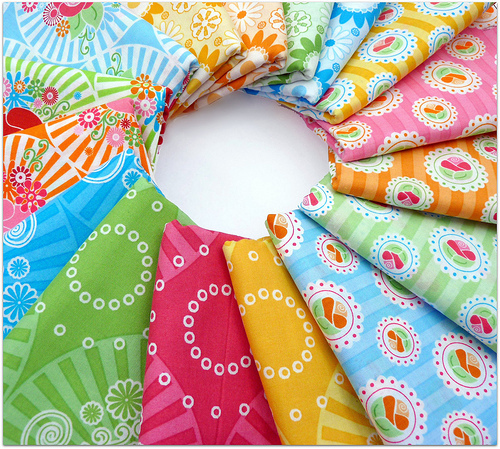 Yummy fabrics, and I think Super Zig just might be my next quilt! Adorable! I think I scared my husband with my audible squeal when I first saw this line a while ago. I'm glad to see you have some- we all know you will do it justice! If you think Melanie in the comment above squealed and scared her hubby, you should have heard me squeal and scare mine when I saw you had my fabrics, and your amazing photos, and all the kind comments!! I totally just pee'd all over myself. To heck with my day, you just made my YEAR!